We enjoy being able to download virtually any kind of information with a few swipes of the finger, but there is a small amount of satisfaction missing from the digital download process. Remember the anticipation you felt as a kid when you fed quarters into a gumball machine and waited for your prize to drop into your hand? 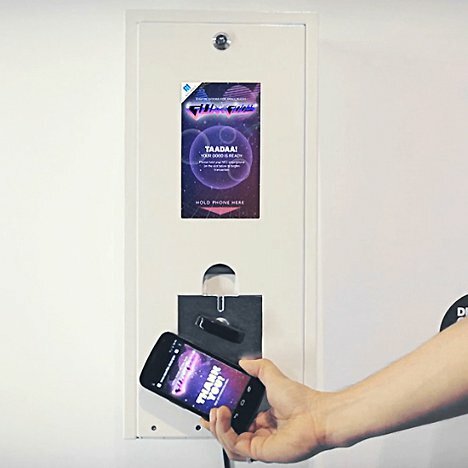 Razorfish is bringing that feeling back with their coin-operated app dispenser which they call the NFC Gumball Machine. The machine is kind of an exploration of NFC (near field communication) technology. After a buyer plunks a few coins into the machine and twists the metal lever, the game, book, song or whatever else he bought is delivered via NFC by touching his phone to the dispenser flap. There’s the old-school rush of paying for something you want with real money and then patiently following directions to get it, but the prize is way better than any gumball or plastic bracelet we ever got.